Mezaa is a free browser add-on aimed improving the URLs you enter in the address bars. When you misspell an URL, Mezaa fixes it so that you can access the intended website. However, this characteristic is not the only capability of the program. Mezaa is an advertising-supported program, which means that displays third-party advertisements, none of which is owned or endorsed by Mezaa. 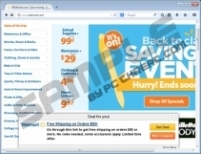 Due to the behavior exhibited, the browser add-on is categorized as adware. Needless to say, you should remove that adware program from your computer in order to avoid accessing phishing websites. Mezaa may seem a reliable program because it is promoted on its official website, which is mezaa.zendesk.com. But do you know that the website contains no download button? The program can be acquired only through bundled installers, and, if you want to prevent programs such as Mezaa, you should be very attentive every time you launch the setup file of any free program. Mezaa is programmed to server computer users with in-line advertisements, video advertisements, pop-ups, web banners, and other ads. As mentioned above, Mezaa does not own those advertisements and accepts no responsibility for the content of the offers provided to you. It means that you use the program and interact with Mezaa advertisements or correspond with third-party websites at your own risk. 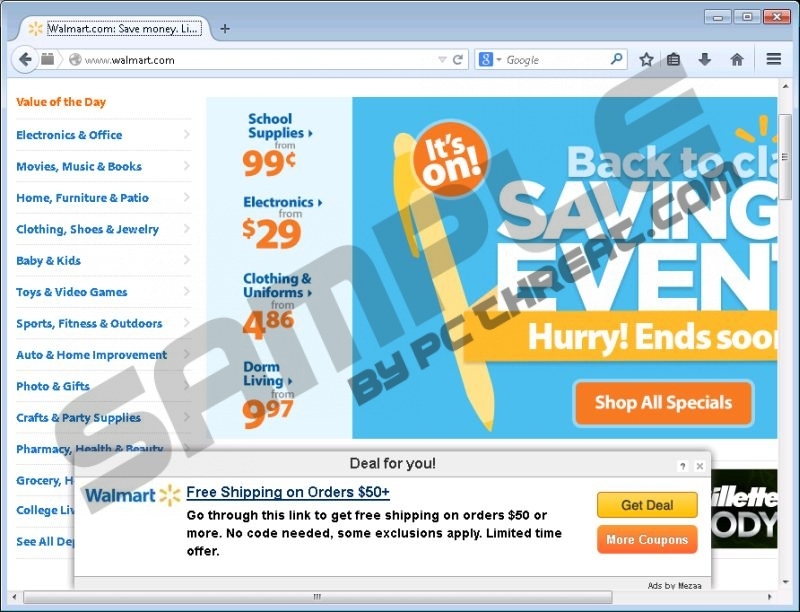 Some of the advertisements delivered to you may be related to insecure website where you may be misled into downloading malware or providing your personal information in some fill-in form. In order to prevent this, you should ignore the various ads displayed by Mezaa and remove the program from the PC. Another reason for eliminating Mezaa from the computer is the fact that the program is capable of monitoring your online behavior. Mezaa automatically records the IP address of your computer, your browser settings, browser language, and some other non-personal information. Information about your Internet browsers and your browsing behavior may be shared with third-parties for various purposes, and, if you do not want to risk your privacy, simply remove Mezaa from the computer as soon as you can. Below you will find our step-by-step instructions that should help you uninstall Mezaa; however, we strongly recommend that you use a reputable spyware and malware removal tool so that you can have Mezaa removed and the system protected. Our advice is to use SpyHunter because it can readily eliminate Mezaa and, without a doubt, fight off Trojan horses, fake security programs, browser hijackers, adware programs, rootkit, worms, etc. You should not keep the computer unprotected because an unprotected computer is susceptible to malware and can get affected by various computer threats at any time. Having removed the adware program, you should install a reliable scanner to make sure that the computer contains no files related to Mezaa. If you do not remember installing Mezaa, scan the system right now because you might have installed some other unreliable programs, too. Quick & tested solution for Mezaa removal.